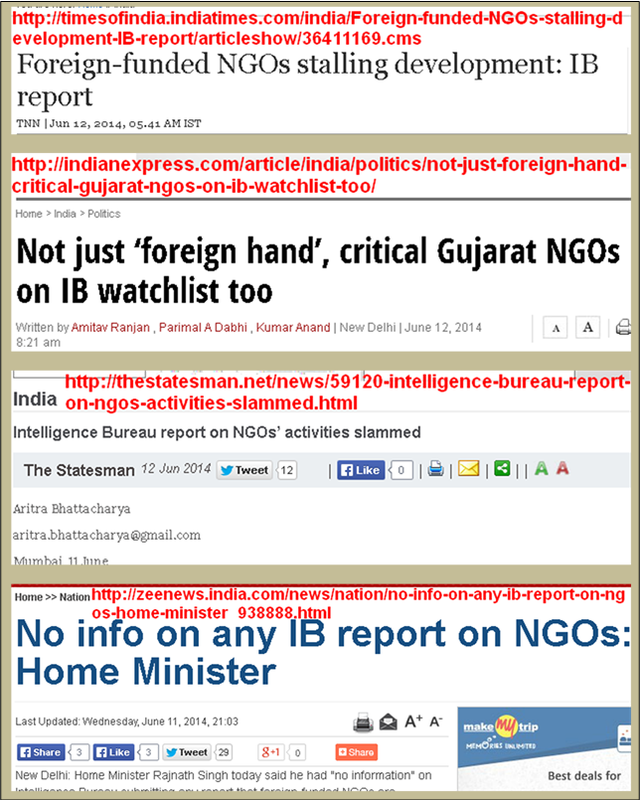 The import of above words will be clear at the end of this post, but as I write this post (15:00 hours on 13th June 2014) a press conference is to open at Constitution Club in Delhi regarding the ‘leaked’ Intelligence Bureau (IB) report about how the foreign funded NGOs are nixing India’s development story in the bud. The report claimed the negative impact of NGO activities @2-3% of GDP growth, a huge figure, which translates to some Rs. 200,000 to 300,000 Crores of GDP loss per year. Indeed, had these “nefarious NGO activities” been absent then the report would have us believe that the last 2/3 years of UPA rule would have still registered rollicking 7-8% of GDP growth. Media has covered the “leaked” document quite widely during the last 2 days while highlighting different aspects suiting the editorial policy of different papers. The charge of plagiarism is established beyond doubt. But should it be blamed on Modi or the servile and sloppy Babudom, which is lazy and incompetent beyond words? Rather, it may be a cheap, crude and brainless tactic (if one is to believe “business like” approach of new CEO) to ingratiate itself with the new dispensation. If lazy, incompetent, cheap, crude or brainless sound too harsh and baseless adjectives, then take a look at page 5 and 6 of the IB report. It has reproduced an “impressive map” that gives locations of 16 nuclear plants [existing or proposed] and 5 uranium mines marked prominently. The scanned copy of this map was allegedly found in the laptop of a German National, Rainer Hermann, who is said to be a “contact” of S P Udayakumar. Then it goes on to grandiosely conclude an international conspiracy involving “organized agency” or “highly professional well-funded entity”, which expends considerable effort in masking its origin. What proof does it offer for this nail-biting suspense thriller? Sustained analysis revealed that the name slips (giving contact details of 50 Indian Anti-Nuclear activists) were handwritten in order to avoid possible detection by text search algorithms said to be installed at e-gateways. 1. IB should be the agency (or its sisters like NTRO, CMS, DRDO-NETRA, NATGRID) responsible for having the “text search algorithms” installed at e-gateways. Then why does it say “said to be installed at e-gateways”? Either it shows utter lack of coordination among different intelligence wings or worse, lack of self-confidence. And then cap it with “Sustained analysis”?, which makes such claims shockingly childish. 2. Why would a prominent Anti-Nuclear activist like S P Udayakumar need a foreigner to tell him who are the other Indian activists in his field of interest? 3. Lastly, the “Location Maps” and “information” on India’s Nuclear Plants is available at many sources: Nuclear Power in India, Nuclear Power Corporation Of India’s own website hosted by NIC that gives Plants in operation and their location or Plants under construction, or see a power-point presentation (pages 11-13, 18-19, 20-23), quite obviously by a non-professional. So, what is the big deal about the “scanned map” found on German’s laptop? Frankly, much of what the report contains is in the public domain (even on WWW) at different places and moments, when most of the mentioned mass movements were happening in real time. I am pretty sure that IB must have submitted many such reports to previous NDA-I, UPA-I and II governments; and IB has merely condensed some of these reports into a new one as “fresh initiative”. Anyone tasked to produce a desk-research based study-report would have easily accomplished the objective with certain motivation and sense of purpose; and of course with access to internet, computer and Google. I shudder to think that India’s premier intelligence agency, IB, can come with such shoddy “secret report” and has the gumption to offer it for nation’s CEO’s consumption. I would like to believe that somebody has pulled a fast one on IB by producing this “fake secret report” to make IB a laughing stock and additionally bring disrepute to the new PM. On the other hand, if this report has indeed been prepared by IB, then some other tantalizing possibilities emerge. -One of them I have already mentioned: the use of adjectives lazy, incompetent, brainless is vindicated- Just witness the repeated intelligence failures. -Else, knowing the fondness of Modi for “development” and visceral dislike of “NGOs”, the IB’s top echelons did this “quick-fix” to get CEO’s instant approval. In that case the adjectives cheap and crude readily stick to the agency’s conduct. -Lastly, considering that the “secret report” leaked within a week of its circulation shows that either someone from among the recipients not sympathetic to the new government leaked it to discredit both IB and PM; or else may be IB top brass did a “hatchet job” on Modi by producing and leaking this report so that it creates a far and deep stink to portray Modi and his government as the only anti-NGO dispensation in India. Coming to the NGOs, I have seen among them some Scamsters, Fraudsters and Self-servers. Moreover, a few of the NGOs, it cannot be denied, may have been set up by foreign interests inimical to India with the help of suitable local recruitments. However, to look at every NGO that receives funding from abroad with jaundiced eyes would be the worst travesty of justice or for that matter to suspect any NGO just because it is an NGO. The treatment of NGOs in this respect cannot be separate from treatment of the government, government organizations [GO] or Private Organizations [PO]. Every action of government or GOs or POs is not inimical to the interest of the people or mired in self-serving corruption. Nor does the fact that the government, GOs or POs get foreign funding make every such entity suspect. The mala fide or malfeasance has to be proved and each case judged on merit. Therefore, Foreign Funding doesn’t automatically become an ‘F’ word it is made out to be. Every funding has an objective. It must be judged and proved specifically that objective and actions flowing out from it are harmful to the nation. When Foreign Investment, Direct (FDI) or Institutional (FII), flows to India (or when it flows out), it has its own interest paramount and not the interests of the host country. Similarly, the sole aim of private organization is profits and growth, and has little regard for what is good for the country as a whole or its people. It is the government that is supposed to act as a watchdog to make everyone behave in people’s interests including its own gargantuan set up. Does it perform this role well or not is the true litmus test of not only good governance but of ethical governance. Else, it becomes the case of sacrificing people’s interests and managing dissent solely in the interests of “Growth” and “Development”. This is where the opening sentence of this post comes into play. Politicians need the votes of the general populace in sufficient numbers to win the power in an electoral democracy that has one person one vote as the principle of political equality. But politicians need far more sorely copious amounts of money to run an effective electoral campaign. Now that money can come only from those who control vast fortunes -the moneybags, who see it like any other investment made in business and expect a handsome return on investment. That is why while people may get to elect the “government they like”, but the moneybags get to select “the policies they want” the government to pursue. Politicians who are adept at running with the hares (people) and hunting with the hounds (moneybags) succeed in electoral democracy. Modi has been favoured by Corporates not because he has better or different policies than the UPA. Modi has been favoured because he is seen to be supremely potent to expeditiously implement those policies, which UPA-II proved to be utterly impotent to realize in practice. Modi has proved to be a very effective orator and seasoned campaigner. Would he deliver the laissez-fairepolicies that he was so overwhelmingly campaign-financed to deliver and which would allow Corporates largely to do what they want while holding the discontent and opposition of the masses at bay? Only future holds answer to this question.